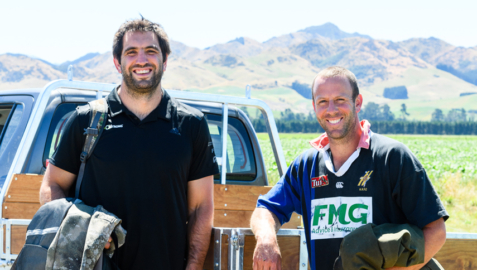 In March 2019 Farmstrong ambassador Sam Whitelock visited the Bay of Plenty. First off the bat he had a backyard game of cricket with local team ‘Benuaud’s backyard bumpkins.’ They are a social cricket team of local farmers and growers who get together every summer and enjoy playing cricket together. Sam then visited guests of New Zealand Kiwifruit Growers Inc. and talked to them about the importance of planning a break. Later in the day he got to meet the BAYGOLD staff at La Vigna orchard, where he spoke about checking in on your mates and planning regular catch-ups. For more great tips on wellbeing and how you can look after yourself, have a further look around Farmstrong. Make sure you take the wellbeing checklist too, to find out where your wellbeing is at.